New from Asanaro: a quick-reference practice poster for the Secret Art of Boabom! 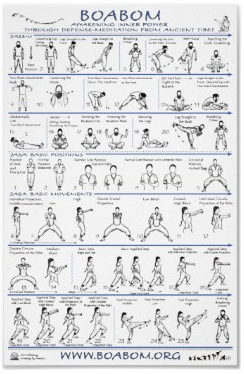 Useful for the beginner or advanced practitioner, see this poster shows the complete sequence of movements from the book the Secret Art of Boabom. This poster is now available via zazzle.com. For more information on Asanaro and his books,visit www.asanaro.com. Posted on Friday, June 15, 2012, at 5:04 am. Tagged Asanaro, Boabom & Seamm-Jasani, defense-meditation, poster, zazzle. Bookmark the permalink.